To draw a dashed line in Photoshop you need a dashed line brush. In this tutorial I will first tell you how to create a dashed line brush. 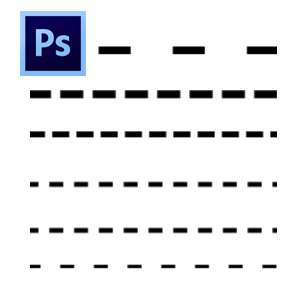 Second, I will show you how to make a dashed line in Photoshop. Also you will learn to make a dashed outline for shapes. To create a dashed brush in Photoshop, create a new PSD file with size 150x50px. Press Shift-F5 to fill the layer with color black. Go to Edit > Define brush preset to make a dashed brush. Open the Brush Settings Photoshop panel and choose the brush that we made in the previous step. On the Brush Tip Shape tab you have to increase the Spacing of the brush to around 450% or more. Check the Shape Dynamics tab and set the Angle Jitter to Direction. You can adjust the size of the brush and the spacing to get different dashed lines. To use the dashed line brush you have to save it. So click on the right top corner button and choose New Brush Preset. Now you can use the dashed brush to create a dashed line. Use the Brush Tool and simply draw using the dashed line brush. If you want to obtain straight lines you have to hold down the Shift key. Another method is to use the Pen Tool and the Brush Tool to draw a dashed line in Photoshop. Pick the Pen Tool(select Paths) and draw a line with 2 points that is now a working path. To draw the line just right click on the Work Path and choose Stroke Path. From the list choose the Brush Tool. This method can be applied to curved paths and you will obtain curved dashed lines. All you have to do is to create a curved path using the Pen Tool. Then you stroke path like in the previous step. You can make a dashed line rectangle in photoshop or a dashed line circle. So, use the Ellipse Tool, the Rectangle Tool or any other Custom Shape with the Path option selected. Then Stroke Path and you get a shape with a dashed line outline. If you are a beginner you might want to take a look at my previous tutorial on how to draw a line in Photoshop. No comment(s) for "Dashed Line Photoshop"